Before we get started, there are some things to note. Firstly, most public baths require you to be naked. Baths may or may not be gender segregated, so its best to check beforehand. Next, most public baths also do not allow tattoos. If you have tattoos and are planning on visiting, booking a ryokan with a private bath is your best bet if you cannot easily cover them. Lastly, if you book a reservation with a ryokan, do check if they offer free shuttle services, as some of them very conveniently do so. On to the actual article! 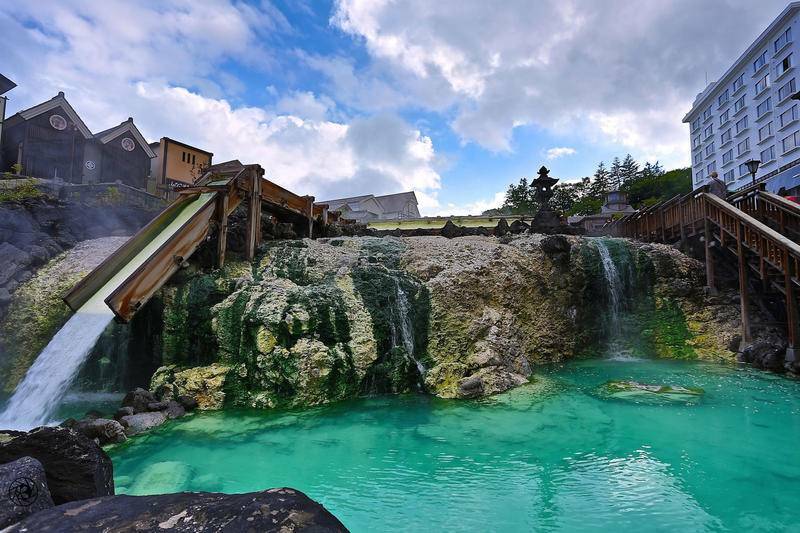 Kusatsu is arguably Japan's most famous hot spring resort, being listed as the number one onsen resort for 14 consecutive years, with 13 public baths. 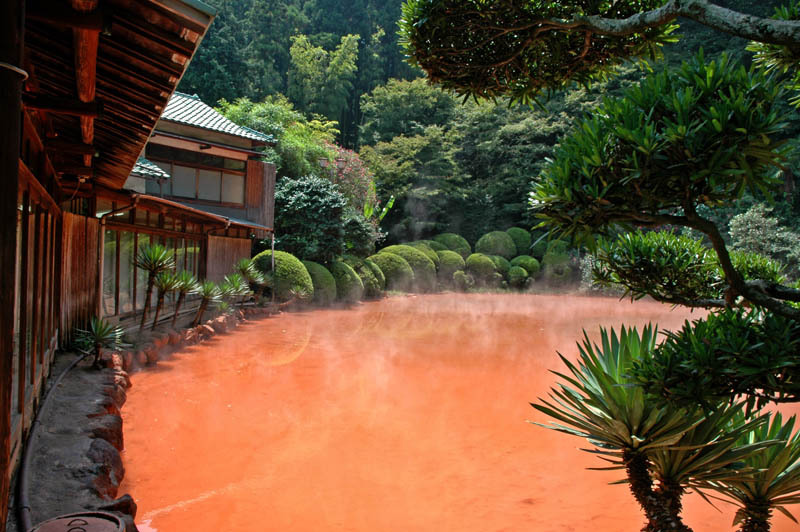 The town boasts one of the largest volumes of high quality hot spring water in Japan, with antibacterial properties and sulfuric content that is said to smoothen the skin. 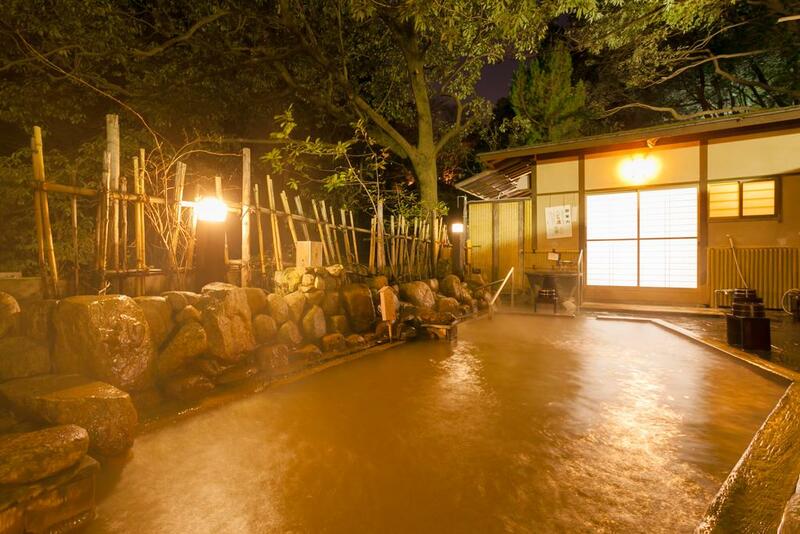 Natural onsens can be found within lovely traditional ryokans and bath houses. 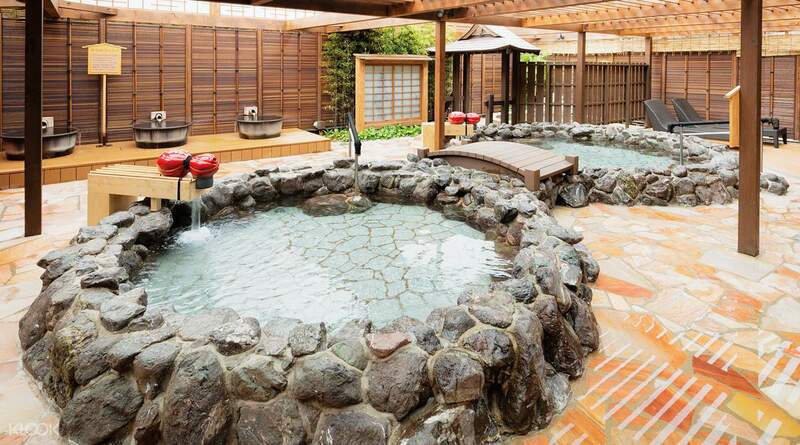 Some of the most popular open air baths include Sainokawara Rotenburo onsen- an open air bath house with beautiful views, Otakinoyu onsen- a bath house with traditional wooden interiors and outdoor options, and Gozanoyu- a bath house with a stone and wooden bath. 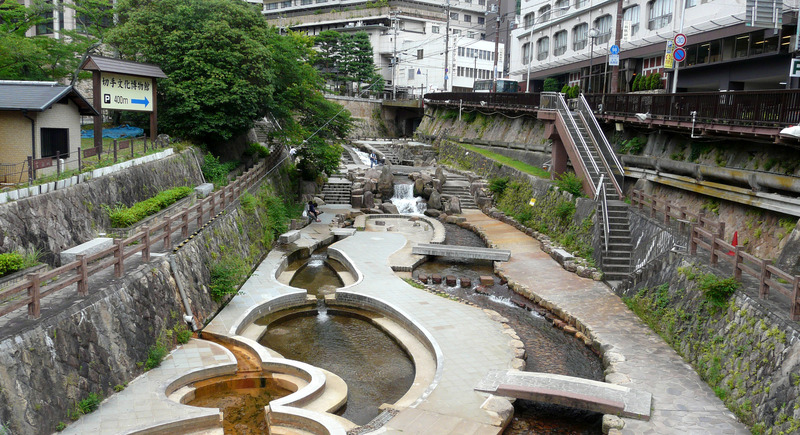 Yumomi, which is a traditional method of cooling boiling spring water, is a symbol of Kusatsu. 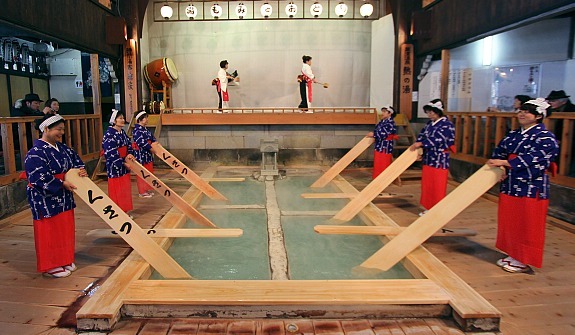 Performances are held daily in the Netsu no yu building, adjacent to the yubatake, accompanied by folk music and dances. 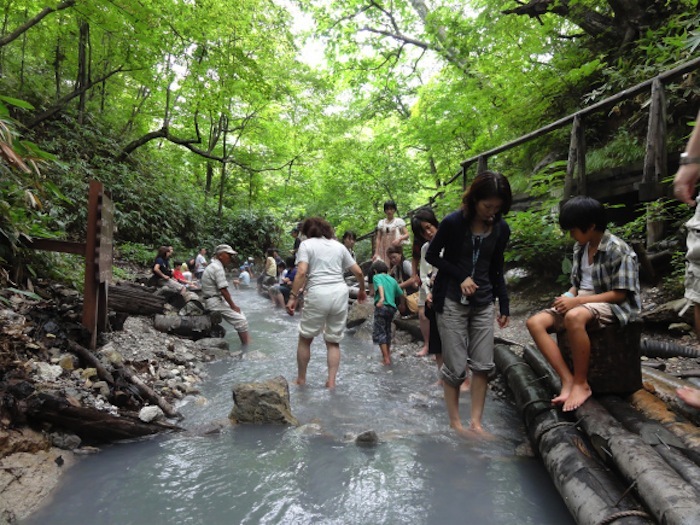 there are even a few foot baths (ashiyu) found around the town that can be used by tourists for free. You can easily find them next to the town centre Yubatake (hot water field), or just outside the bus terminal building. The town is accessible from Tokyo via train. This trip is ideal for those with JR passes, as train is required to reach Naganohara-Kusatsuguchi Station (2 hours by limited express) before taking a JR bus to Kusatsu (30 minutes, 690 yen). This train trip is otherwise very expensive. You can consider purchasing the JR Tokyo Wide Pass, which is valid for 3 days, for 10,000 yen, which is already cheaper than 1 round trip. If you do not have a JR pass, taking the JR highway buses from Tokyo (Shinjuku JR Highway Bus Terminal) is the cheapest and most convenient option. The one way trip costs 3300 yen and takes about four hours. 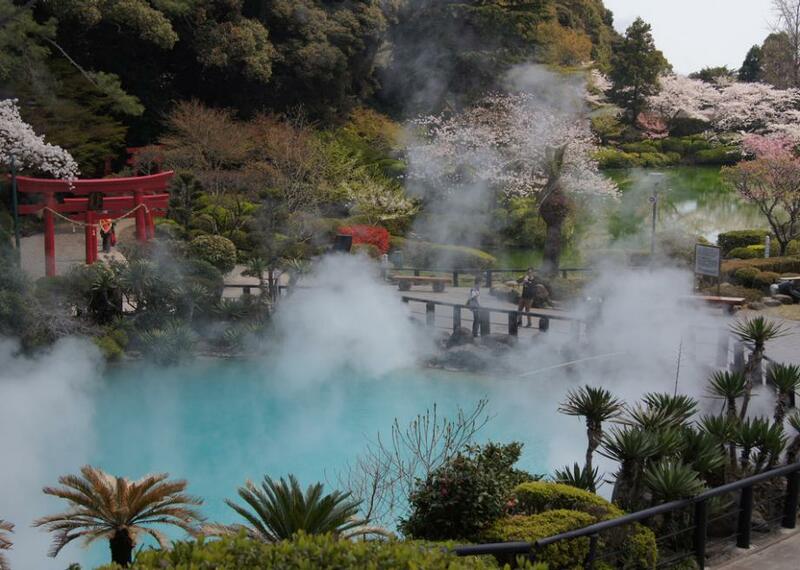 Beppu is an extremely famous hot spring resort, flaunting eight main springs, named Beppu, Kannawa, Myoban, Kankaiji, Hamawaki, Kamegawa, Horita and Shibaseki. 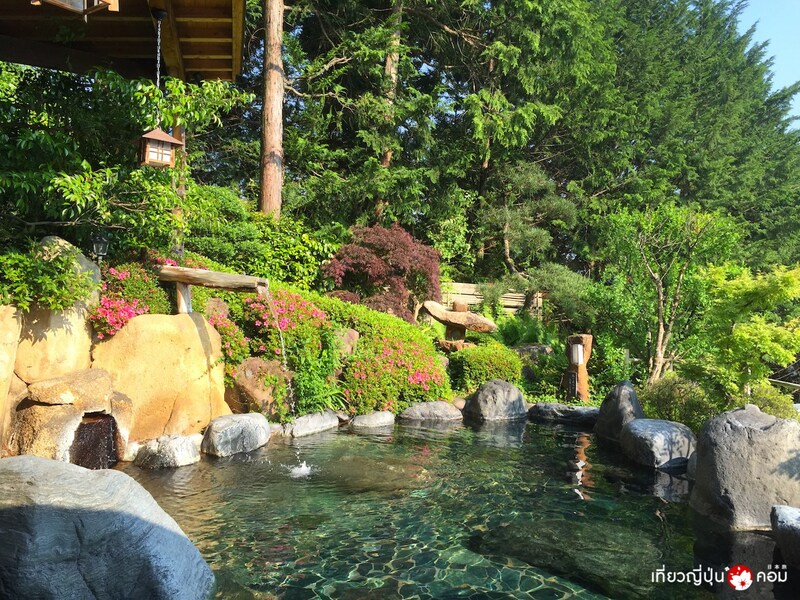 Together they produce more hot spring water than any other onsen resort in Japan. 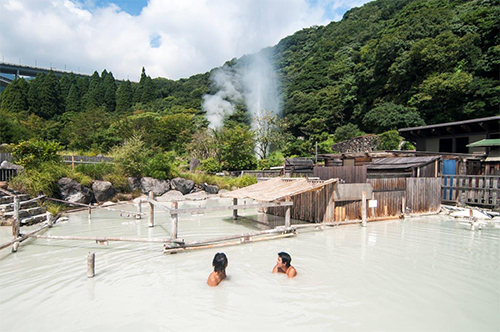 When discussing the best hot spring resorts in Japan, Beppu regularly comes up because of the wide range of bath types that can be enjoyed. 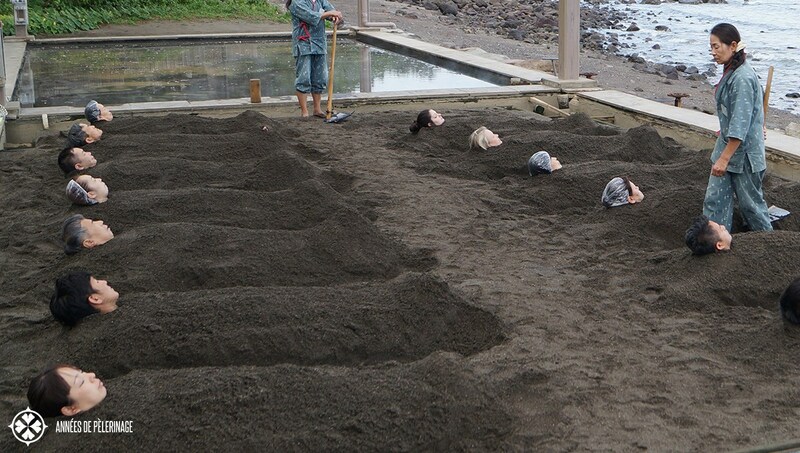 Besides the usual hot water baths, Beppu is also famous for its sand baths where you can bury yourself in naturally heated sand, steam baths which are like natural saunas, and mud baths which are said to be very good for the skin. Besides these springs for bathing, there are jigoku (hells) for viewing and cooking local delights. Tourists can steam their own meals at the Jigokumushi Kobo Steam Cooking Center, guided by staff. You can choose plates of portioned dishes, before heading to the steaming area, which charges 510 yen for 30 minutes. 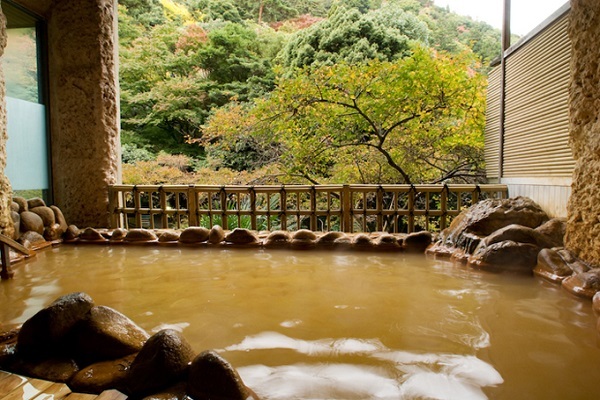 Some of the most famous bath houses include Tanayu- a leading ryokan with outdoor pools with spactacular views, Aqua Garden- a mixed gender bath enjoyed with bathing suits and onsen hoyo land- the place to go for mud and steam baths. Beppu is on the southern island Kyushu, and is thus accessible from major cities Fukuoka, Nagasaki and even Hiroshima. Nishitetsu Bus operates highway buses between Fukuoka and Beppu. The one way journey takes 2.5 hours and costs 3,190 yen. If you have a JR pass or a Kyushu rail pass, you can take the sonic limited express train from Fukuoka's Hakata Station to Beppu. This otherwise very expensive. If you choose to fly in, the nearest airport is Oita airport. The one way bus journey between Oita Airport and Beppu takes 40 minutes and costs 1500 yen. 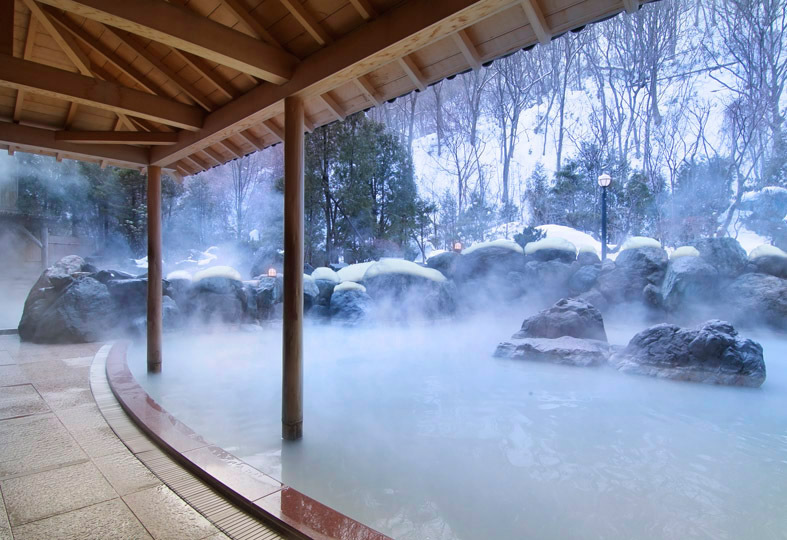 Arima Onsen is often regarded as one of the best hot spring towns in western Japan. The mountainous town is surrounded by nature, and has a long history backing its reputation. 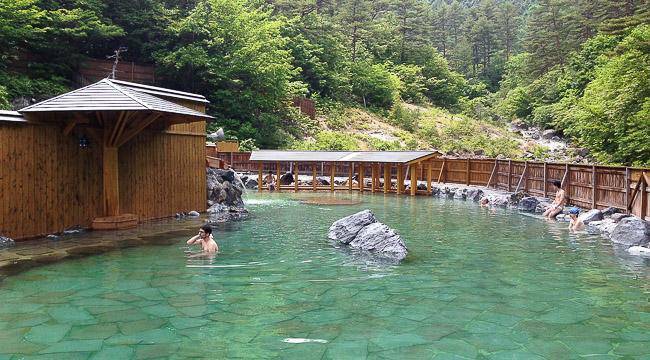 It is considered one of the oldest hot spring resorts, and was regularly enjoyed by royalty and noblemen. The town's spring water is recognized by the Ministry of Environment for having 7 out of the 9 healing properties that can be found in spring water. The Kinsen (gold water) is reddish brown due to iron deposits. It is said to be good for skin ailments and muscle pain. The clear Ginsen (silver water) contains radium and carbonate and is said to cure pain and boost the immune system. There are two public bath houses and many traditional ryokans where you can enjoy the spring water. Several ryokans also open their baths to non-staying visitors during the day. The two public bath houses, Kin no yu and Gin no yu are definite highlights. Other famous places include Goshobo- one of Arima's oldest ryokan and Taiko no Yu- a more modern take on Arima's onsens. Arima Onsen is very accessible from major cities in the Kansai region, such as Osaka and Kyoto by train as it is in Kobe. If flying in, the nearest airport is Kobe Airport. From Kobe, Arima Onsen is accessible by Arima Line bound for Arima Onsen Station. Hankyu and Shinki Bus operate local buses from Sannomiya Station in Kobe (50 minutes) via Shin-Kobe Station (35 minutes) to Arima Onsen. The one way trip costs 700 yen and buses depart once or twice an hour. Gero Onsen was referred to as one of Japan's three best onsens by the Confucian poet Hayashi Razan (the other two being Kusatsu and Arima), and now receives over a million visitors per year. The town is especially popular during the Takayama festival period. 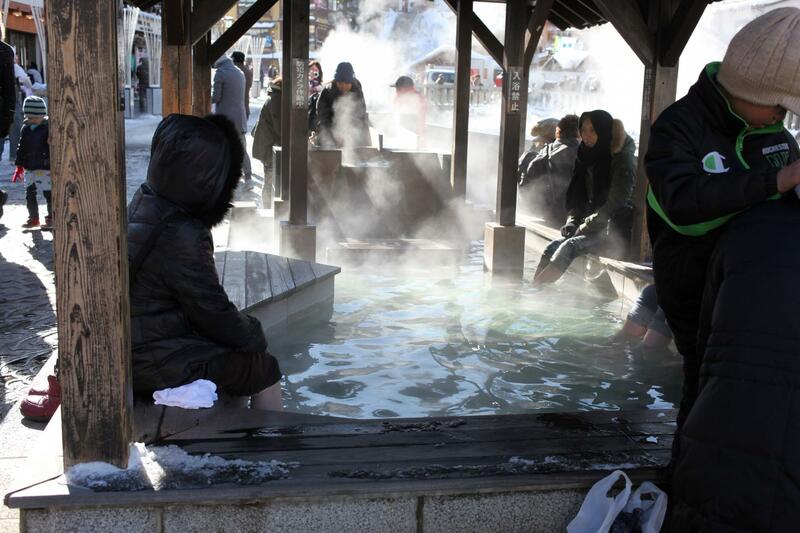 The water of Gero Onsen is slightly alkaline and is said to be mildly scented. It is said to give smooth, beautiful skin and relieve pain and faigue. There are three public bath houses available in the town, along with many Ryokans. The best part about Gero Onsen is the Yumeguri Tegata (spa pass), which can be bought everywhere in Gero, including convenience stores, that gives you access to about 30 ryokan baths. At the south end of the Gero Bridge is a large open air bath you can bath in for free, with no other facilities. Like with Kusatsu, there are a few free footbaths found around the town. Gero is accessible from major cities Nagoya and Takayama, but also can be easily reached from the Kansai region by train.The one way journey from Nagoya to Gero takes about 90 minutes and costs around 4500 yen by JR Hida limited express, and is thus more suitable for those with JR passes. From Takayama, you can reach Gero by limited express (45 minutes, about 2000 yen) or local train (1 hour, 970 yen). Local buses also connect Takayama with Gero Onsen. A one way trip takes about 90 minutes and costs 1040 yen. Noboribetsu is considered the best onsen town in Hokkaido, and is also the largest- with many of its ryokans being considerably bigger than those in other places. Several of them open their baths during daytime to non-staying guests. 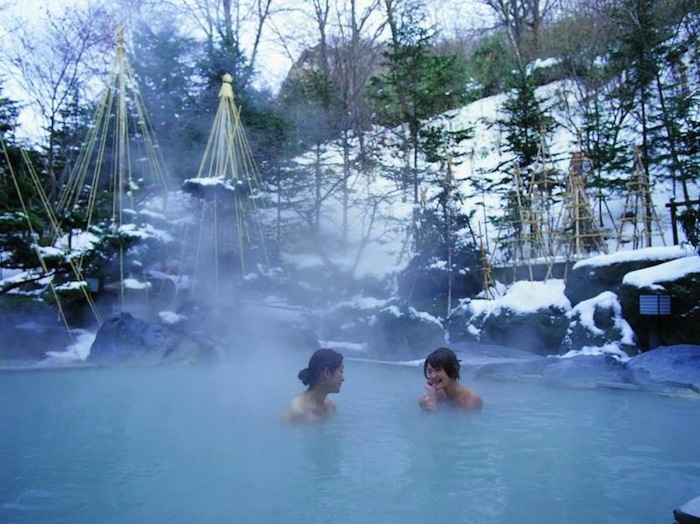 Noboribetsu onsen is actually part of Shikotsu-Tōya National Park, and as such is able to offer 9 kinds of spring waters, with sulfur, iron and various salts that confer healing properties. Noboribetsu's waters come from Jigokudani (hell valley), which itself is worth the visit. 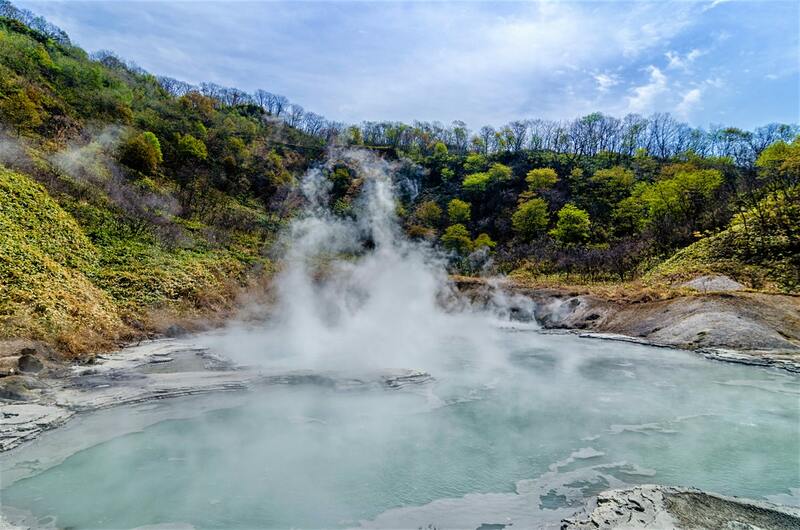 Along with the pretty forested trails beside geysers and rock formations, the valley features Oyunuma pond, from which hot, sulfurous water flows into a river. A natural footbath can be enjoyed downstream of this river. Some of the most famous baths include Daiichi Takimotokan- a bath fed by 7 different springs wit different minerals, Noboribetsu Grand Hotel- a modern hotel with a beautiful outdoor bath and 3 different spring waters and Sagiriyu Public Bath- a small and attractive bath that is popular among locals. Being in Hokkaido, it is extremely accessible from major cities Sapporo and Hakodate. From Sapporo, the journey takes an hour by express (Super Hokuto, Hokuto, Ltd. Exp. Suzuran) and costs 4000 yen one way. From Hakodate, the journey takes 2 and a half hours by express (Super Hokuto, Hokuto) and costs 6370 yen. 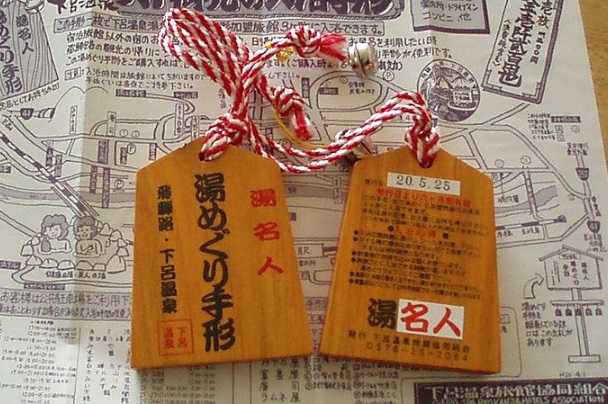 Both journeys are covered by the JR pass and Hokkaido rail pass. If you choose to fly in, the nearest airport is the New Chitose Airport. From the airport, both Hayabusa and the Airport highway bus services will take you to Noboribetsu onsen. However, only the Airport highway bus service is a direct service will take you to the town in an hour, leaving at noon sharp everyday. Hayabusa bus only covers part of this journey. 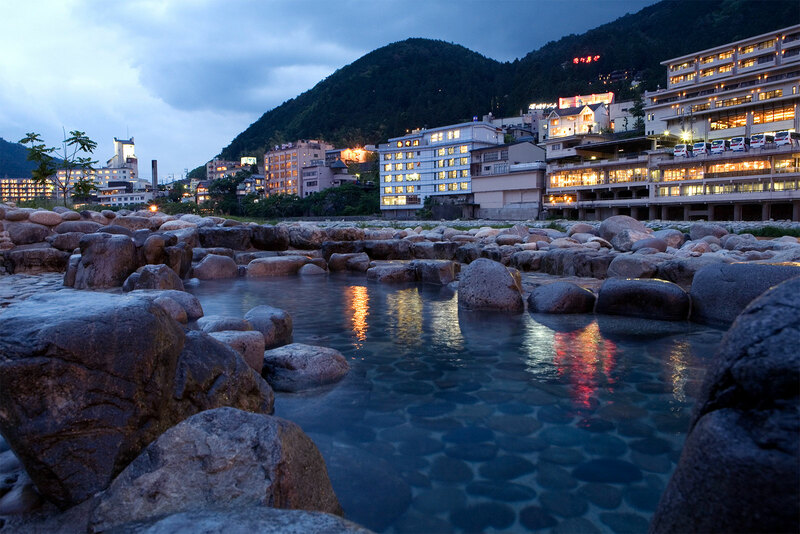 No matter where you travel to in Japan, you're never too far away from an amazing onsen town.